At End of Trail we want your day on the water to be remembered with memories of fishing and relaxation, not pain and frustration. That’s why we take a special effort in supplying you with the best equipment. Our boats and motors are all excellently maintained. When you arrive you will find a boat already to go – tuned up, fuel topped off, safety equipment stowed away and sparkling clean. 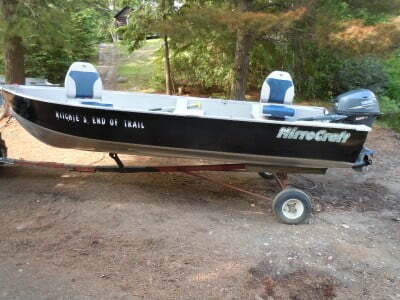 We supply Mirrocraft and Princecraft aluminum boats with 15hp, 4-stroke Yamaha outboard motors. Boats and motors are newer models. For two people we offer the 14 foot Mirrocraft Fisherman boat with a 15 hp Yamaha Motor. 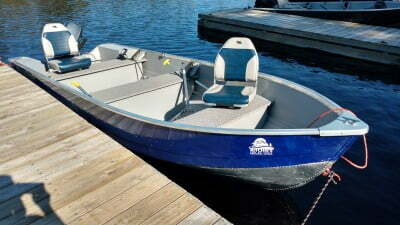 For three people we have the 15 foot Princecraft ‘Yukon’ with 15hp Yamaha Motor. All boats are equipped with padded swivel seats and fish finders! Boats come with all the safety equipment as per Transport Canada’s guidelines.